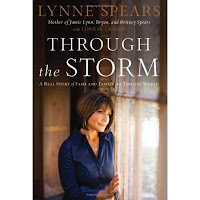 Have you heard of this book by Lynne Spears? Surely you’ve heard of a couple of her daughters, namely Britney and Jamie Lynn, current media fodder and regular tabloid cover girls. The book is Lynne’s side of the still unfolding story of the Spears family. Admittedly I was curious to read it, both as a mom and as someone who spent much of my childhood and early teen years around the entertainment industry. It isn’t a parenting book, but it isn’t quite a memoir either. I would call it a cautionary tale supporting the idea that we only get one chance to raise our kids, a privilege not to be taken lightly. Surprising to me was that Through the Storm was published by Thomas Nelson, known for publishing Christian books. I wouldn’t have pegged the Spears family as “Christian”. Many celebrities profess “Christianity”, but live out their lives in ways that make me wonder how they define it! In her book, Lynne tells the story of her life beginning with her mom as a young war bride in England, through the birth of her own granddaughter Maddie. She tosses in words like faith and mercy, sprinkling throughout the book examples of hours spent in prayer, God’s grace, and God’s plan, which she seems to be seeking but feels like she has missed the mark. I didn’t feel this was a woman who continually lives out her faith, only that she knows to turn to God when times get rough, and Lynne Spears has certainly had it rough. Over all, it’s a disjointed venture that feels like it would have made a great 60 Minutes interview on television, but doesn’t really hold up in book form. It was as though she narrated her thoughts to be transcribed, rather than having someone edit it into something more than rambling tales, or extended sound bites. I also got the feeling that she was desperate to clear her name, frequently stepping aside from her story to say, “The tabloids said this, but in actuality…”, rather than simply telling an engaging story that would allow the reader to come to their own conclusion- that Lynne Spears has done the best she could under the incredible circumstances. I couldn’t figure out who her audience was… either the housewives who might pick it up at Wal-Mart in the “Inspiration” section or Perez Hilton, who continually slams her. It also appeared to be a way for Lynne to thank every last person who was ever friendly or nice to her, giving extended call outs that even she recognized would probably embarrass the person she spoke of. As a mom, I felt there were really two points worth taking away from the book. First, Lynne felt torn between her own career as a school teacher and that of her daughter Britney, who was exploding onto the pop world, which Lynne regularly points out that she had no experience with. She recognized that people might come and take advantage of Britney, yet handed over the reigns of control to people whose goal is to make cold hard cash. And if you've gone grocery shopping in the last year and read the headlines in the check out counter, you know how that turned out! Not all parents will have famous children, but the lesson here is that it pays to be highly involved with the things that interest our children, and some sacrifice may be necessary. The second point was buried in the last chapter of the book. In stating her regrets in raising her three children (which also include older brother Brian, currently trying to make it in film production), Lynne says she wishes she had gone beyond just bedtime prayers and simply taking the kids to church when they happened to be in town. If she had it to do over, she would have led them through daily Bible reading and devotions, teaching them practically how they could really rely on God. She feels this might have prevented the self destruction they brought upon themselves. How true. If we tell our kids to love others and show compassion, but never live it out by giving them practical examples and lots opportunities to practice, we should not expect them to grow up to be loving and compassionate! We’ve all heard of the parent who is wise, wonderful, and does everything “right” only to raise an adult who seems to be a rotten apple. Or the incredibly bright, brilliant, and compassionate young adult who comes from a background of neglect and absent parents but goes on to do incredible things. But after reading Through the Storm, I think it is better to firmly take hold of the parenting reigns and make raising our children a priority, rather than just leaving it to chance and hoping for the best.